I have to say a BIG thank you to Pediatric Health Associates today for being SO amazing (even though they always are). Thank you for fitting my daughter in with Dr. Chalson 5 minutes in advance and for making my sick 3 year old feel super special on her birthday…the one day you’re never supposed to be sick! Thank you guys for being so awesome and returning the paperwork I needed for daycare so quickly. You are the best! This is the fourth pediatric office I have taken my kids too. Yes, I said fourth. I am finally happy with all aspects of what a group of pediatricians should be. They are thorough, accurate with paperwork, responsive, patient, and fair. You can get an appointment in a timely manner and be called back when needed. The doctors never make you feel like you are overreacting, which in my case always feels like the case. We have been going there for about four years. I am so grateful that I listened to a local group’s recommendation, considering that I don’t live locally to this office but it doesn’t matter. They are also accessible through Facebook and give an answer in a fair amount of time. They are excellent at communicating through e-mails too. I am constantly recommending them and will continue to. We’ve been using PHA for just about 9 years now. I have 3 children (ages 9, 7 and 18 months). Often people ask me why I travel 25 minutes for a pediatrician when there are several practices 5 minutes away. For me there is no questioning it. The care, respect and comfort I feel at PHA is exceptional. Open 365 days a years, I’ve never had a problem getting a sick child seen. Doctors never rush out of the room and make you feel to busy. There is something to be said for doctors that take their time in addressing my concerns. Whether it’s after hours or 9am, calls get returned in a very reasonable time. In today’s world of social media, a Facebook page is another outlet for getting questions answered…whether it’s sending a photo or asking about dosage. Online appointments, forms and records are all available online, which makes getting what you need so convenient. We want to thank you for the prompt fill of our son’s new EPI Pen prescription. I left a message on the answering machine last night after I read about the recall and before I had a free moment to call the office this morning, I already had a text from CVS that it was filled. Thank you for all you do for our children. I am continually impressed by the amazing advice you provide so quickly on this website (facebook.) This should be the benchmark for all physicians. The level of care and response you are providing to us using this site is outstanding. Thank you. I have been meaning to send you a note of thanks for taking the time to listen to my concerns. 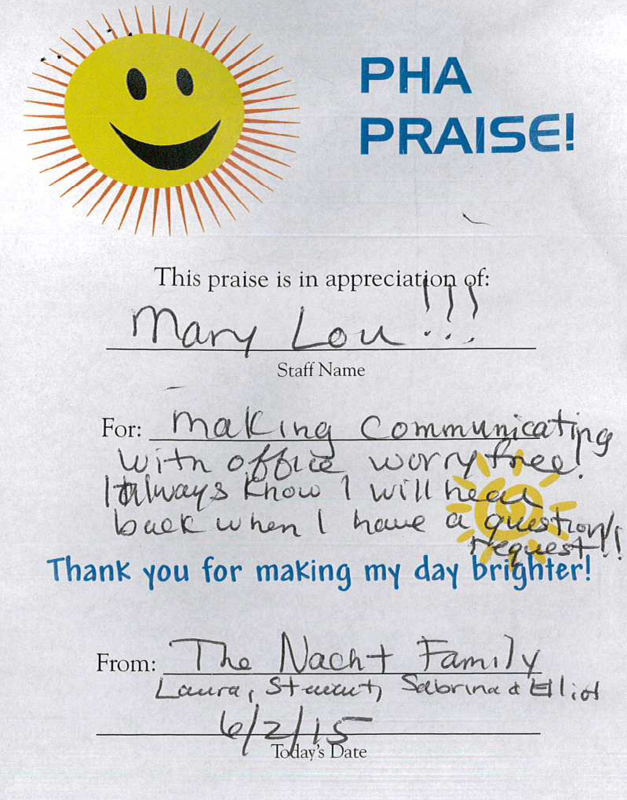 We are always grateful for the care you provide to our children. We appreciate all you do and the time you spend when we visit. Just want to say to all the DOCTORS at PHA – we miss you very much here in Texas & thank you so much for taking such good care of my kids for their 1st 12 years!!! I still recommend you to my L.I. friends! Dr. Fierstein, are you aware of any PCP practices that are as amazing as you guys are with kids, but for adults? I need a PCP and just seem to compare every practice against you guys! Thanks! Thank you for another “quick and painless” visit today. Relieved that my daughter doesn’t have pink eye. But, as always, from check in to check out, a positive experience. 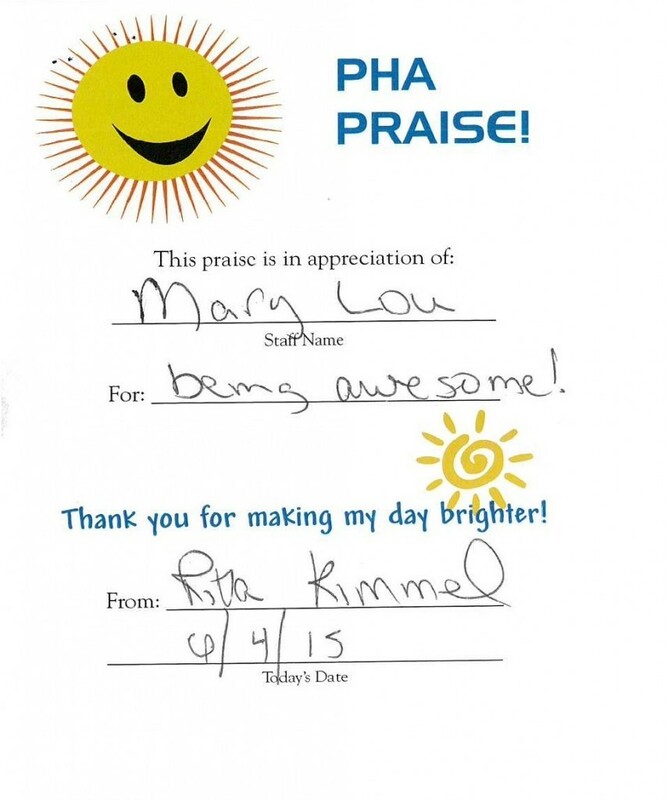 Thank you, office staff, nurses, and doctors of PHA! BTW, the check in on the iPad is great. And I love the updated app. So much easier to find your child’s EMRs. Oh, and your nurse – I’m sorry, I forgot her name – took me on a “tour” to show where you’re expanding to. Congrats on all of these great additions to your practice. …having the lab, and the fact that you are there 7 days was what made me choose you when I moved here from Staten Island almost a yr ago…which was very difficult since i had my old ped for 10yrs, and due to the difficulty of finding ANY docs the even heard of my daughters illness Fanconi Anemia. I needed a lab as you can see we are in quite a lot for cbc’s..lol and thank you all so very much for your willingness to keep a copy of her handbook and help me deal with her very difficult illness….A Special Thanks to Dr. Goldstein for helping when my daughter needed a cbc due to nosebleeds and you were closed. You told me exactly which urgicare to go to and called to check in on us that night and the next…it showed you cared, which means ALOT to me. When I talk to my friends and they are like “my pediatrician doesn’t do that” I know how lucky I am. The best doctors! The milestone questionnaires, the baby vision test (my one friend said her Ped never did that until they were older), blood work at certain visits, follow up calls, after hours calls. They have to go to urgent care at night or on weekends. Same day sick visits also. And of course they don’t have facebook access. My one friend switched pediatricians after she realized how much hers didn’t do compared to you guys. She lives in NYC so too far to come to you. I recently switched over from another practice and I’m very happy with the office and the doctors. Hi! I just had to post … I love your practice , the staff and Dr.Read!!!!! My son was in the other day and honestly every time I leave I think in my head… I am so thankful for PhA!!!! The patience, kindness, so knowledgeable.. I could go on… Thank you to all of you! It means so much. I am a big believer in letting people know the good stuff… Too often in life it is the complaints! And I was with another practice years ago … Which makes me appreciate all of you even more!!! Hi! We were in the other day and nothing brightens my day like seeing Dr.Read! We love all you guys! Xo Hope everyone has a safe, happy summer! Hi. I am so happy that one of my girlfriends informed me about this site. This is such a great idea. I’ve already read tons of past posts that pertain to me, as well…thank you for doing this. I love this practice and all of the doctors are amazing. Thank you all for taking such good care of my 22 month old twins and having such patience with me-a first time twin mom with lots of questions. A huge thank you to whoever faxed my daughter’s vaccinations/medical records to our daycare this morning. As always, your front office staff is helpful, kind, and professional. Hi Dr. Fierstein, we just wanted to say thank you so much for your patience with Jake today and being so great with him. We hope you know how much it is appreciated! !